Almost Half of Brits Don't Know This War Exists. Now There's a Campaign to Make People Pay Attention. "We urge the public not to look away." Yemen is experiencing the worst humanitarian crisis in the world. People are facing starvation; a lack of clean water is spreading disease through the already weakened population; families are facing a constant struggle for survival. Conflict directly threatens so many of the UN’s Global Goals, including health, nutrition, and education, and the international community can’t turn their backs on the people caught up in this conflict. Join the movement by taking action here to support the Global Goals. In Yemen, almost half of the population is facing starvation. Millions have fled their homes; more than 85,000 children have died from extreme hunger; schools and hospitals have been hit in airstrikes. And yet, just 58% of British people know that Yemen is a war zone, according to a YouGov poll published in October. 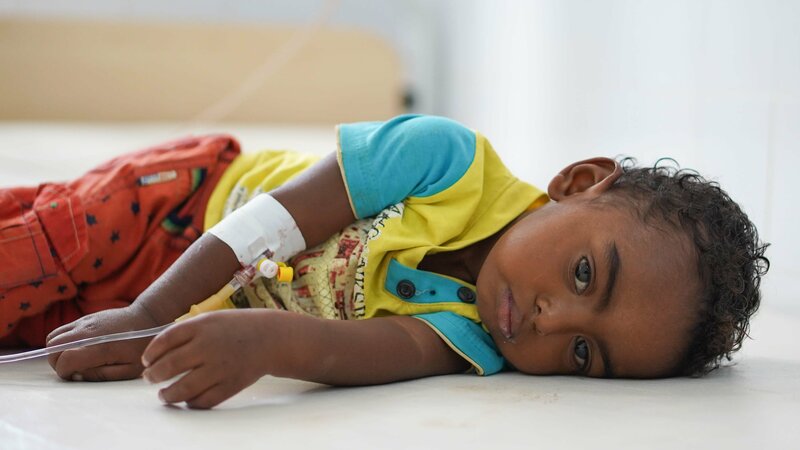 Violence escalated in Yemen in 2015, and since then it has been a continuous struggle for aid organisations and international bodies such as the UN to keep the conflict on the international radar. Meanwhile, Saudi Arabia has been leading a coalition of states in a military campaign to restore Yemen’s government. In the past three years, Saudi Arabia has become the world's largest importer of weapons — and the US and the UK are the kingdom's top suppliers. The civil war has hit Yemen’s already impoverished population hard. According to the organisations’ letter, parents are now forced to give their children contaminated food and water, or give them nothing at all. One of the many families who have borne the brunt of the conflict is the family of one-year-old Rafi, who is suffering from malnutrition. Rafi’s parents have already suffered the loss of his two brothers. One was aged one year and four months, and died after being diagnosed as malnourished and having diarrhoea for a couple of weeks. The other was just a month old, and his mother was told he had cancer. Now 31-year-old Habiba, Rafi’s mother, is terrified about the prospect of losing more of her children. “We used to receive some food items [from the World Food Programme], but now have had nothing for three months, we don’t know why,” Habiba said. Rafi and his parents fled al-Hodeidah governorate one year ago, when the missiles started to reach their neighbourhood.